a 39-year veteran of Detroit area media as an editorial cartoonist, writer and corporate journalist. Dan is proud to be a member of the Association of American Editorial Cartoonists. 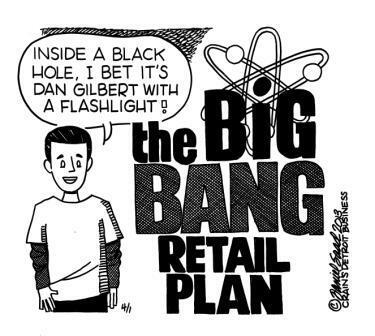 Dan Gilbert announced a "Big Bang" plan to revive the downtown Detroit retail district - that would be a blast! Coming Soon - Watch for a 35-year retrospective of metro Detroit editorial cartoons by Dan Saad, "My Own Backyard." The collection will include selections from The Daily Tribune and The Grosse Pointe News, as well as selections from his current cartoon client publications. Copyright 2012 Dan Saad Cartoons. All rights reserved.